All Proteins Are Derived From Non-GMO Vegan Food Sources. Your Skin Immediately Responds To This Flood Of Proteins. The Protein Fibers In Your Skin Instantly Become Stronger Making Your Skin Tighter, More Toned, Smooth, Silky Soft And Moisturized. This Deeply Penetrating Vegan Protein Facial Oil Improves Your Skin In A Way No Other Ingredient Can. Have You Ever Wondered Why As You Age Your Skin Sags, Becomes Wrinkled, Muscles Shrink And Your Hair Becomes Less Thick? They All Involve A Lack Of Protein. Science Has Proven That Every Year Your Need For Protein Increases Until It Doubles What You Need When Your Young. And You Can't Build A Reserve Of Protein. Your Body Can Only Use About 30 Grams Of Protein At Any One Time And Any Excess Is Excreted As Waste. Because Your Skin Is Almost All Protein, Its Logical To Assume That If Your Skin's Protein Levels Are Low Its Going To Sag And Become wrinkled. Protein In The Form Of Collagen Has Been Used In Skin Care For Decades With Little To No Results. The Reason-Collagen Is To Large To Penetrate The Skin. It Just Sits On Top And Gets Washed Off With Your Next Shower. Collagen Used In Skin Care Is Made From Animal By-Products And The Plant Derived Collagen Is Made From Genetically Modified Tobacco Or Corn. Neither Will Increase Protein Levels In Your Skin And They Are Not Healthy Source Materials For Ingredients. If You Want Your Skin To Absolutely Look Its Best Then Your Going To Have To Keep Your Skin's Protein Levels Elevated. Trying To Improve Your Skin When Your Skin's Protein Levels Are Low Is Like Trying To Start A Car With No Gas. Why Do Body Builders And Fitness People Look So Good In Their 50's, 60's, 70's Even 80's. That High Level Of Protein They Are Consuming To Build Muscle Is Spinning Over To Their Skin. If Your Serious About Keeping Your Skin Looking Its Best Then Adding This Vegan Protein Facial Oil To Your Daily Skin Care Routine Is Smart. Obviously Producing A Vegan Food Source Protein Oil Is Not An Easy Thing To Do. Proteins Normally Don't Dissolve In Oil So To Solve This Problem We Developed A Sophisticated Trade Secret Process That Doesn't Use Heat Or Chemicals And Allows The Plant Proteins To Become Dissolved In The Oil So They Are Carried To The Deepest Layers Of Your Skin. 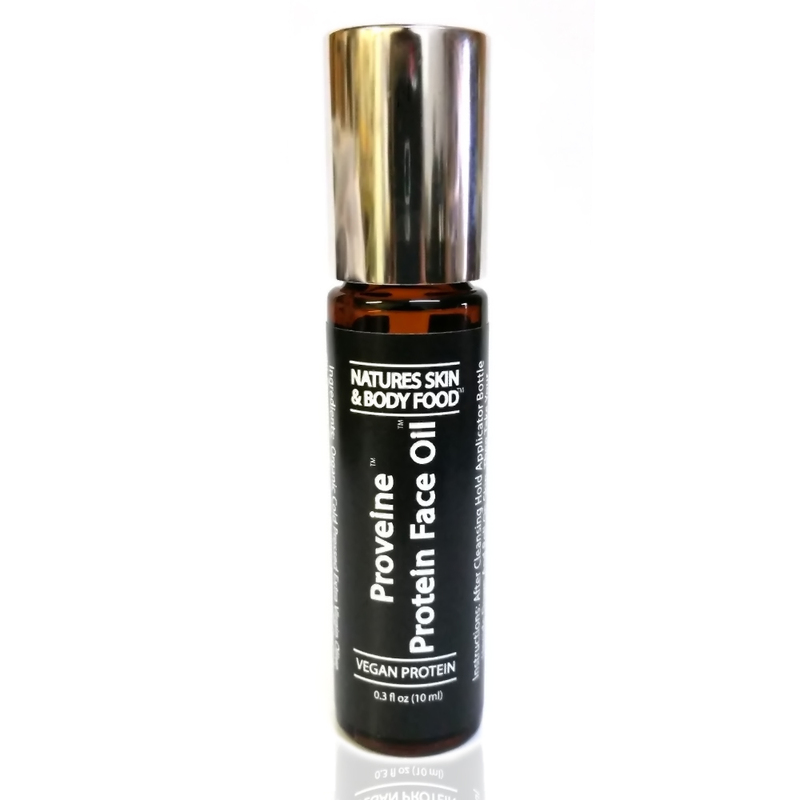 This Protein Facial Oil(tm) Is Very Powerful And Only A Small Amount Is Needed To See Visible Results. One Bottle Should Last 30 Days.